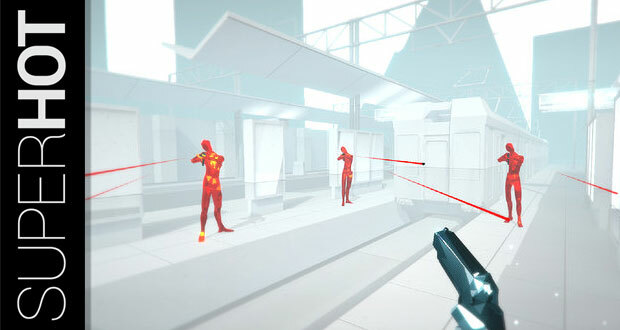 Three years of thought went into the think-between-steps shooter gameSuperhot, which was released Thursday. Born of a week-long first-person-shooter game jam, Superhot’s concept caught the attention of the Kickstarter crowd, raising US$250,000. The indie title is available on Windows, Linux and OS X. It will arrive on Xbox One next month. It’s a novel approach to the FPS genre, reminiscent of the movies Crank andSpeed. In Superhot, stopping doesn’t come with a consequence such as a bomb detonating on a speeding bus or a lethal dose of crank killing the protagonist. It’s quite the opposite. When the player character stops moving, everything and everyone around the individual slows to a crawl, similar to Max Payne’s Bullet Time. That gives the player the advantage of being able to weigh the most precarious of situations at any time. Though shards of its core mechanic have been seen in other games, Superhothas found success in anchoring itself to the novel approach to the FPS, according to Matthew Diener, analyst for EEDAR. “Superhot is the sort of game that sounds so bizarre in concept that you wouldn’t think it would work, but once you see it in action, it makes you wonder why no one’s tried it before,”. As for story, Superhot breaks the third wall to tell the tale of a player becoming sucked into the game itself. The player and player character find themselves being drawn deeper into the metaweb, and the gameplay gets more intense and difficult in turn. All of that makes for an experience that’s rewarding and worthy of praise, said Joost van Dreunen, CEO of SuperData Research. The game’s core mechanic has existed for years in “rogue-like dungeon crawlers like the Mystery Dungeon: Shiren the Wanderer series,” said van Dreunen, who first got his hands on the game about a year ago. However, “Superhot presents it in a much more immediate and flashy manner — yet the fundamental stop-to-strategize gameplay mechanic is pretty much the same,” he said. Games that follow in its footsteps may find fewer people following them than the crowd Superhot has drawn, said Diener. The novelty could fade after players run into this mechanic three or four times. While others may not be able to run with the idea, the Superhot team might be able to get more miles out of the concept. It’s basically a virtual reality game that isn’t in VR, Diener said. “It would be an easy game to translate to virtual reality based on its graphics, perspective and general design — but the stop-to-strategize mechanic would provide a welcome and clever way of preventing player fatigue and disorientation,” he said.